It started when the real "David Seville" was facing bankruptcy, and spent his last $100 on a two-speed tape recorder. Soon he'd recorded a novelty record for Christmas that in 1958 sold an amazing 4 million copies in just 7 weeks. And "Alvin and the Chipmunks" were born. His heirs are determined to keep the franchise going. After the movie was released, the Chipmunks' official web site began pointing visitors to an "iMunks" page for downloading Chipmunk mp3s — and not just songs from their new movie! Now re-located to Amazon.com, it includes nearly 100 songs from their 50-year career, including an 80s cover of the Knack's "Good Girls Don't," a 90s version of the X-Files theme, and their country duets with Tammy Wynette, Waylon Jennings, and Billy Ray Cyrus. After the death of their original creator in 1972, his son re-launched their career in 1980 with an album called Chipmunk Punk. It included the Chipmunks' covers of songs like My Sharona and Blondie's "Call Me," and they continued their novelty success through the 90s with albums like "Club Chipmunk." (Its dance tracks featured their high-pitched versions of the B-52s' "Love Shack," the BeeGee's "Stayin' Alive," and "Play that Funky Music, Chipmunk.") There's even a version of "Hey, Macarena." All these songs are available on the iMunks page, but unfortunately, there's a six-song minimum. The Chipmunks' new marketers are offering "silver," "gold," and "platinum" packages where the per-song price drops from $1 apiece to eighty cents. But what's really newsworthy is that the singing rodents are here at all. In 1996 a lawsuit alleged that Universal Studios had bought a controlling stake in the Chipmunk franchise, but then “undertook the systematic destruction of a family owned and operated business” (according to an article in L.A. Business Journal.) They also reported the suit’s claim that Chipmunk-related revenue dropped 98% under Universal. But there's a happy ending. Ross Bagdadsarian Jr. — the son of the original "David Seville" — told the business journal that “Everything turned out great in the end," and the big budget movie has already earned back its production costs, grossing over $84 million in its first ten days. 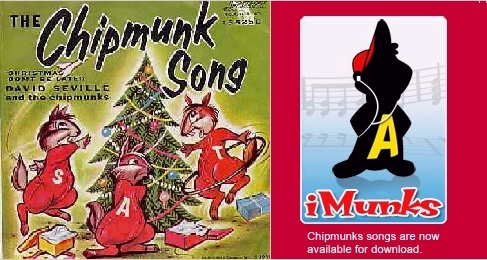 The movie's closing credits even show record covers from the Chipmunks' multi-generational career, along with a note applauding Ross Bagdadsarian Sr. for having faith in his singing novelty act. And in the film the address of Dave's apartment is "1958", subtly reminding audiences that the Chipmunks have sung his song for nearly fifty years. The film opens with the Chipmunks singing Daniel Powter's "You Had a Bad Day," and they later win Dave's loyalty with a doo-wop version of the classic song "Only You (Can Make the World Seem Right)" while standing in the rain. (Which they segue into "Funkytown," complete with choreography.) Despite the movie's flaws, a lot of care went into the choice of songs and the storyline. It's drawing mixed reviews. (The New York Post declared that "this charm-free atrocity is awful enough to instantly cure any remaining nostalgia for the rodent trio.") After their tree in the forest is whisked away to Los Angeles, the movie launches an obligatory Hollywood sub-plot. The new Chipmunk actors could've been funnier, and Richard Roeper complained that as David Seville, TV's Jason Lee's uses the same acting style he uses on NBC's My Name Is Earl. The "dazed loser" persona may not compliment the computer-animated chipmunks, making it harder to suspend disbelief. But the script was better than expected, giving each chipmunk a complete character and adding a story about whether they'd find a new home in the city. Toronto reviewer Stephen Cole pointed out that in audiences filled with children, the new movie was the favorite over The Golden Compass, "paws down." And yes, the new chipmunks really do love Christmas. And also, Sponge Bob Square Pants. Maybe the film-makers are counting on a Christmas-time indulgence for their film about the giddy singing rodents. The Chipmunks' career has always included equal parts music and humor, and the history of American pop culture shows a strange ongoing love for their high-pitched voices. And for better or worse, they've now found a way to bring Alvin and the Chipmunks into the 21st century. When Kurt Vonnegut Met Sammy Davis Jr.